James B. Stewart’s “Common Sense” columns have examined President Trump’s tax returns and his tax plans for America. Much of the attention will focus on the tax deduction for interest payments by businesses, a provision that Mr. Trump has used to great advantage in what little has been seen of his past tax returns. The House Republican plan calls for eliminating the deduction as part of an overall plan, helping offset lower tax rates. The nonpartisan, conservative-leaning Tax Foundation says the provision could be a $1.5 trillion proposition over the next decade. The National Multifamily Housing Council, a trade association of apartment owners, managers, developers and lenders, has come to the defense of the interest deduction and other provisions favorable to the real estate industry, describing them as “core principles” and promising a fight. So has the influential Real Estate Roundtable, whose board includes several of Mr. Trump’s fellow New York developers. The interest deduction issue “is about to heat up dramatically,” predicted Douglas Holtz-Eakin, an economist who served as director of the Congressional Budget Office and is now president of the American Action Forum, a conservative pro-growth advocacy group. The real estate lobby has prominent allies in both parties. After the last major overhaul of the tax code, in 1986 — under a Republican president, Ronald Reagan, a Republican Senate and a Democratic House — it was a Democrat, Bill Clinton, who signed legislation that restored lost real estate tax breaks seven years later. While the Trump administration has yet to put forward a plan, Mr. Trump has embraced several key proposals, including some at odds with the House Republican blueprint. 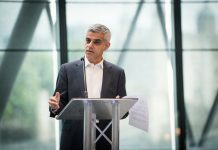 His ideas, in many cases, would enhance benefits to developers like himself. 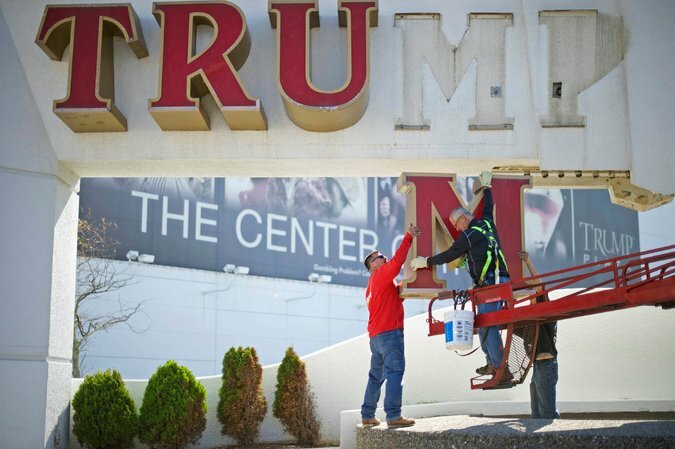 Workers removing signs from the Trump Plaza casino in Atlantic City in 2014. Those with an interest in preserving the interest deduction include big developers, small builders, brokers and contractors. Certain tax breaks, in fact, seem to exist solely or primarily to benefit the real estate industry, with dubious benefits or even harmful effects for the broader economy. Start, for example, with the ability of businesses to deduct interest payments. More than in just about any industry, real estate investors use leverage — borrowed money — to enhance returns. They lower their taxes by deducting interest payments. The New York Times has reported that Mr. Trump’s businesses have at least $650 million in debt. Mr. Trump’s campaign staff indicated last summer that he wanted to keep the interest deduction. But then Mr. Trump came out in favor of another key element of the House Republican plan: immediate deductibility, or expensing, of capital expenditures, rather than the practice of depreciating assets over time. Tax experts broadly agree that the interest deduction is untenable if the code also allows immediate expensing. That’s because many investors would borrow large sums to make capital expenditures (like buildings), immediately deduct all of the cost and continue to deduct the interest payments — “double dipping,” as Mr. Rosenthal put it. The Tax Foundation estimated that immediate expensing would cost the Treasury $2.2 trillion over the first decade. Over time, the amount declines as taxpayers stop taking depreciation deductions. Eliminating the interest deduction would offset some, but not all, of that 10-year loss, while retaining the deduction would create a huge revenue hole. 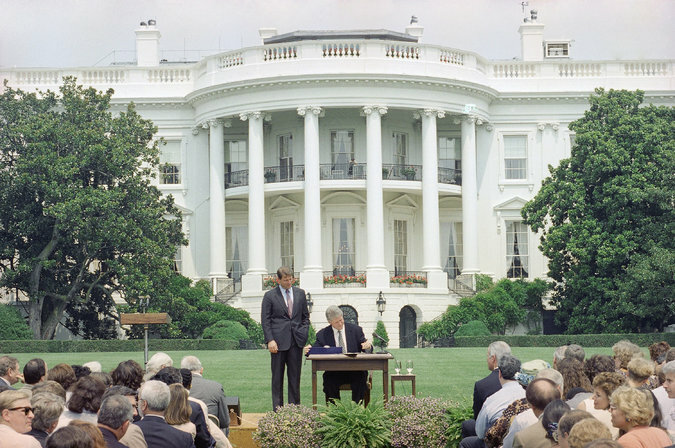 President Bill Clinton, accompanied by Vice President Al Gore, signing 1993 legislation that restored real estate tax breaks lost in the tax overhaul of 1986. In response to the criticism, Mr. Trump pivoted and said he would give taxpayers the “option” of either taking the interest deduction or expensing capital expenditures, not both. But that adds yet another layer of complexity and would be even more costly for the Treasury, since taxpayers would presumably choose the option that resulted in the lower tax bill. Moreover, it is hard to see a path toward reducing overall corporate tax rates — the crucial element in making any overhaul palatable to a wide swath of businesses — without the added revenues from eliminating the interest deduction. Then there is the ability of “active” real estate investors such as Mr. Trump (but virtually no other group) to deduct their real estate losses against other income. That loophole was eliminated for most investors — including real estate investors — in the landmark tax legislation in 1986. But because of aggressive lobbying by the powerful real estate industry, including Mr. Trump himself, Congress passed legislation in 1993 restoring the tax break for so-called active real estate developers. Portions of Mr. Trump’s 1995 tax returns leaked to The Times show that he took full advantage of the provision. 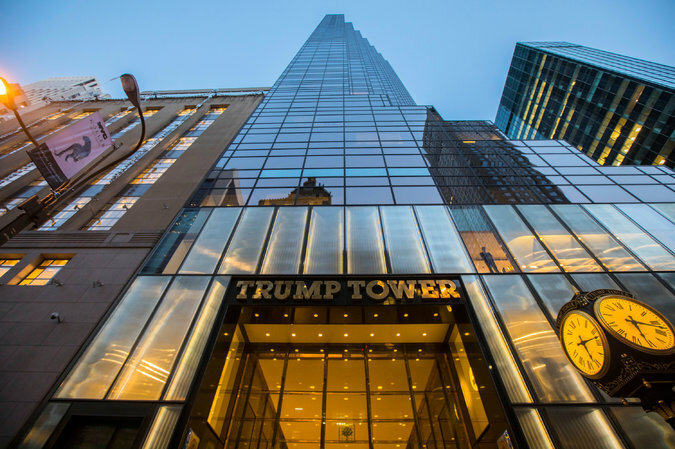 That year he recorded a loss of nearly $16 million from “rental real estate, royalties, partnerships, S corporations, trusts, etc.,” which are the forms in which Mr. Trump holds most of his assets. That was more than enough to entirely offset his $3.4 million in business income, $7.4 million in interest and $6,000 in wages and salaries. Trump Tower in New York City. Many of Mr. Trump’s ideas on ways to change taxes would enhance benefits to developers like himself. 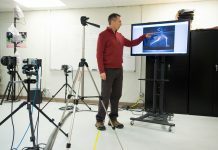 Alan Cole, an economist at the Tax Foundation, said it was difficult to estimate how much that provision costs the Treasury, because the underlying data is not available. Another loophole for real estate developers is the so-called like-kind exchange provision, which allows real estate investors to defer or even eliminate capital gains tax by using the proceeds from a sale to reinvest in a similar property (which does not have to be all that similar — just about any real estate can be exchanged, even an apartment complex for vacant land). Since Mr. Trump has not released his tax returns, the public doesn’t know whether and to what extent he benefits from the provision, but nearly all real estate developers use like-kind exchanges to avoid capital gains tax. The Real Estate Roundtable strongly backs the provision. Mr. Trump hasn’t said whether he would retain it. But it is another special-interest loophole that nearly all tax experts would eliminate. The Tax Foundation estimates that taxing like-kind exchanges would generate $92 billion in additional revenue over 10 years. Advocates of a tax overhaul often point to the 1986 act as a model for a comprehensive approach that ushered in a long period of economic growth. Given the power of the real estate lobby, “presidential leadership was crucial,” said Leonard E. Burman, director of the Urban-Brookings Tax Policy Center and a professor at the Maxwell School of Syracuse University. Correction: April 25, 2017 Because of an editing error, an article on Sunday about the influence of the real-estate industry on tax issues referred incorrectly to the makeup of Congress when it approved a 1986 tax overhaul. Republicans were in the majority in the Senate and Democrats controlled the House; there was not a “Democratic Congress” then.